La Flora Organics brings to you Handmade aromatic bathing bars that are cold processed for 6 weeks to retain natural Glycerine. Cocoa is known to detan the skin. Organic Coconut & Olive oils deeply nourishes the skin. Real Rose petals & Rose oil blended with dark Cocoa powder makes this bubbly bathing bar a must-have.It moisturises & cleanses the skin with a long lasting aroma. Explore the entire range of Soaps available on Nykaa. 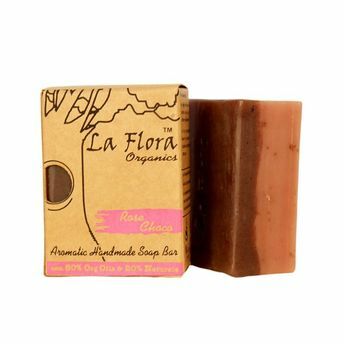 Shop more La Flora Organics products here.You can browse through the complete world of La Flora Organics Soaps .